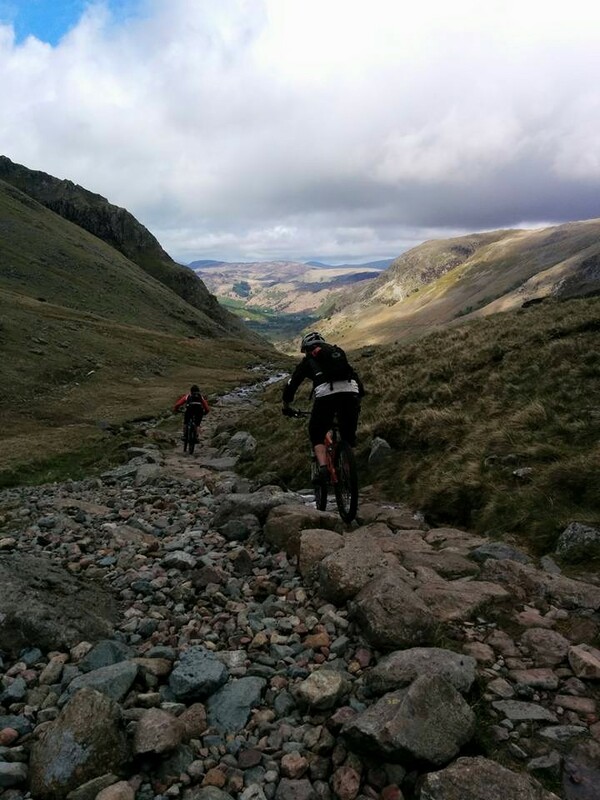 Circumnavigating the huge 899m-high bulk of Great Gable in the northern Lake District, the 25km route apparently packed in some of the best technical riding in Cumbria – but demanded a heavy physical toll in return. 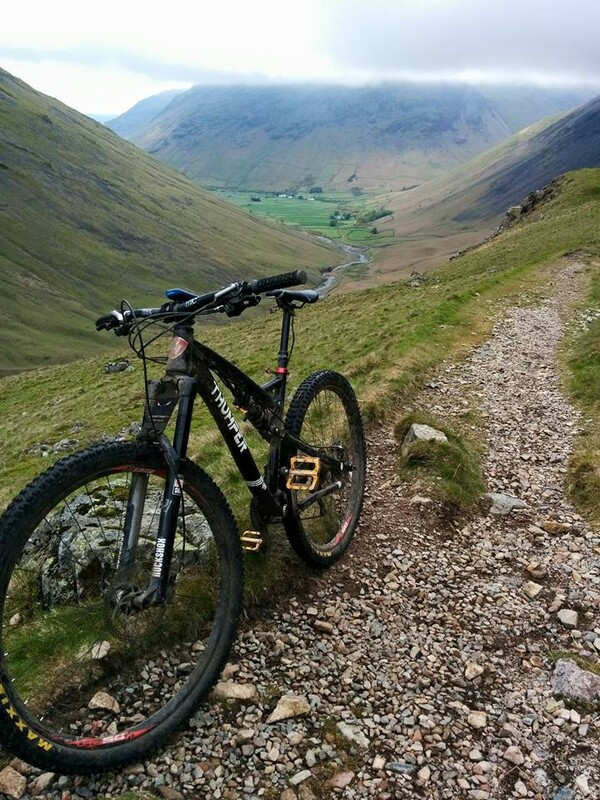 So after improving my fitness over a couple of years, I found myself parking up at the bottom of Honister Pass on a Bank Holiday Monday back in May this year to meet Chris and our Scottish pal Gregor – ready to finally tackle this fabled beast. Gregor hefting his Alpine up one of the passes. Parking on the Buttermere side of Honister Pass – we headed almost immediately into the steep track up Scarth Gap. We only made the most token of token efforts and gave up pedaling after about 30m, first taking to pushing our bikes and then hoisting them onto our backs as the gradient steepened. It wasn’t pretty, but it was certainly effective as a means of gaining height, and after what felt like about 10 minutes we’d notched up more than 300m of altitude – and were faced with the first descent of the day. I hadn’t been riding my 29er much lately so was happy to bring up the rear – and was glad I had done when I found myself riding appallingly, bouncing off rocks left right and centre and completely failing to hold a line down the trail, which featured the odd steppy corner but wasn’t hugely demanding. Realising my front tyre was rock hard, I stopped for a quick deflation break and things were much better once I’d resumed. I was just about getting my eye in by the time I reached the others on the undulating track over to the isolated Black Sail Youth Hostel – a dinky little building only served by Land Rover tracks and popular with walkers and riders on multi-day trips. One of many rocky downhill bits. There was no stopping for us though, and we pressed on across the valley and up Black Sail Pass – again only getting a very brief pedal before the gradient forced us out of the saddle. 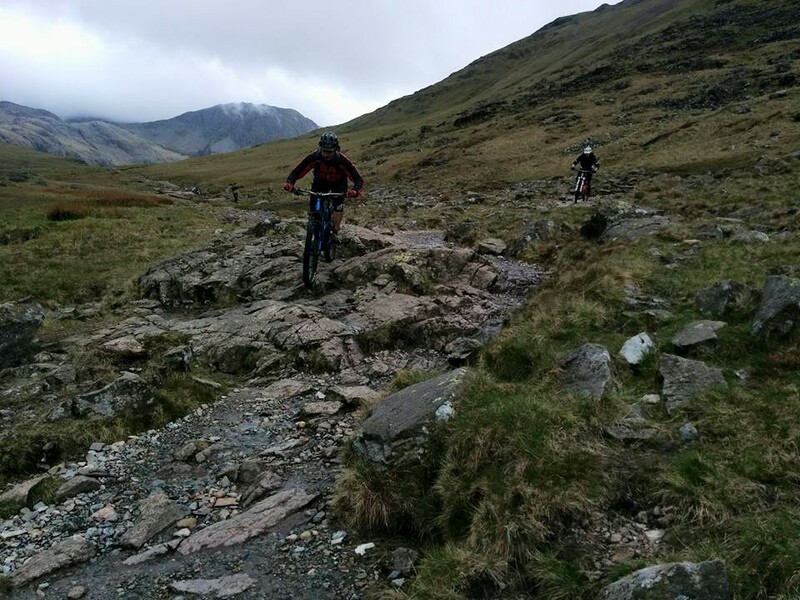 Early on in this climb came a tricky rocky outcrop which prompted a careful scramble with bikes on backs, then it was a less demanding plod up – again with bikes on our backs for much of the time – all the way up to the top of the pass. And after having a bit of a ‘mare on the first descent of the day, what followed was much, much more enjoyable. Starting out wide and rocky, the trail had an Alpine feel at the top and wasn’t steep enough to require a lot of braking – so it was fast, technical, rocky fun with just the odd awkward bit of stone or water bar to catch us out. Slackening out gradually as we dropped down the 400-odd vertical metres, it felt like the descent was egging us on to pedal faster as we got closer to the bottom. With just one or two quick stops to regroup, the whole drop took us a healthy 17 minutes. The Thumper was a pain in the neck (literally) to carry, but rode just fine. 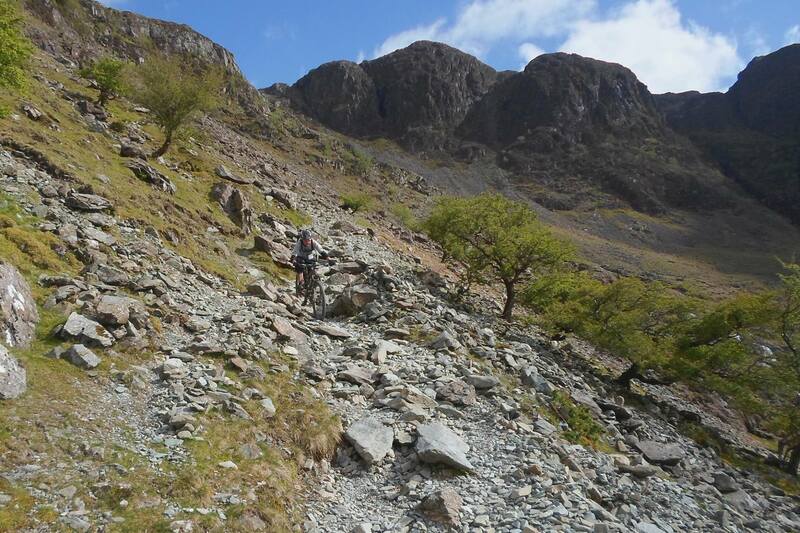 because so much of it was rugged and steep and required bikes to be carried. I’d got my portage technique sorted, but by this point of the day my downtube had rubbed the back of my neck raw – and that seemed to be the only way I could keep the bike stable. My lack of flexibility was making itself known as well at this point, with Chris haring off into the distance and myself and Gregor taking smaller strides as we languished a fair way behind. On the last climb the downtube of my bike had been annoying me as I balanced it on my neck. The way the metal had been manipulated meant that it narrowed into a “sharper” point just where it sat on my skin. Now it was really bloody hurting and I was frustrated that I couldn’t find any other position which provided a neutral balance point. So it was with great relief that we finally caught up with mountain goat Chris at the top of the pass, stopping for a bit to enjoy the view and scoff some sandwiches. I’m going to be honest and admit now that I left it too long to write this ride up, so I can’t remember the exact details of the descent – just that it was rocky, fast, fun and went on for a suprisingly long time. I do remember that we had no complaints at the bottom anyway. 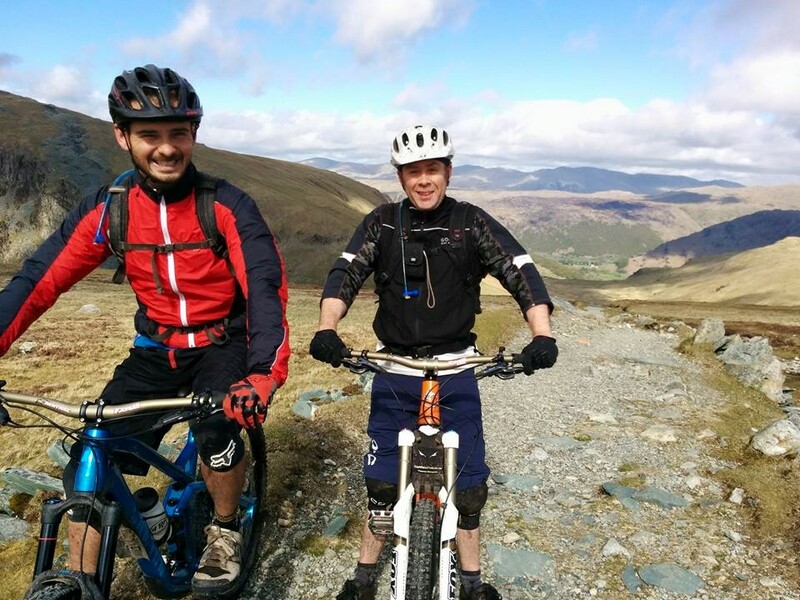 Chris and Gregor on one of the flatter sections. 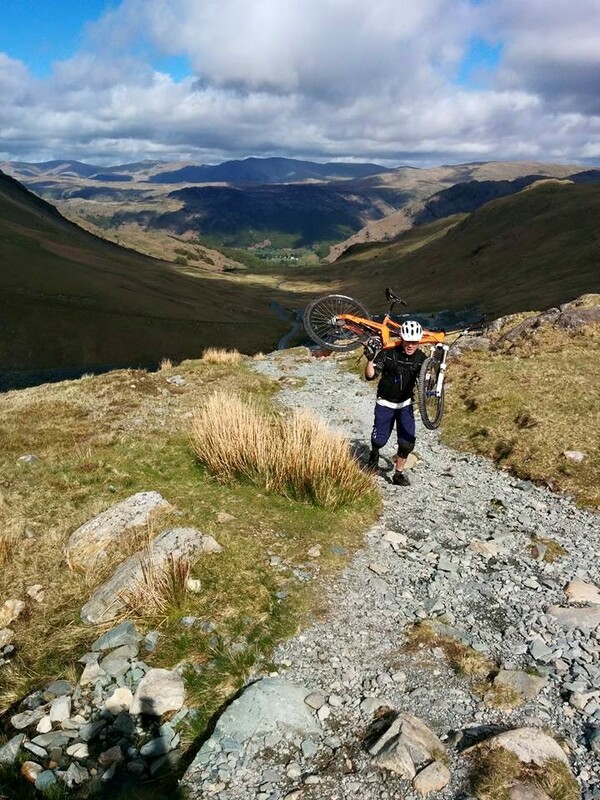 A road ascent of the famous Honister Pass followed, from the Borrowdale side. Steep from the outset, it didn’t really let up very much and Gregor and myself soon decided to get off and walk rather than completely cook our already tired legs. Chris was waiting for us at the slate mine visitor centre, having already treated himself to a coffee, and we pressed on off road, climbing higher through the mine premises towards our final descent. I had ridden Warnscale Bottom before, remembering it as a technically demanding but reasonably flowy downhill that went on for a good 10 minutes or so. So I was soon contemplating the unreliable nature of human memory at the same time as tackling the gnarliest terrain I’d ridden for a good while – pumping, thrusting and twisting my way across rocks that were just the right side of rideable. I was seriously impressed with the ability of my 130mm 29er to handle this kind of trail – and the big wheels even seemed to give me an advantage over the others on some of the medium-sized chunder. But of course with limited rear travel I had to be careful not to get too carried away on the bigger hits – just keeping the bike rolling and dealing the conveyor belt of gnar that the trail was serving up to us. The trail was as unrelenting as it was long – with about 360m vertical to deal with – so we were not disappointed when we finally reached the bottom in one piece, leaving us with an easy pedal out to the car park and a waiting ice cream van. Picking my way through the rocks. 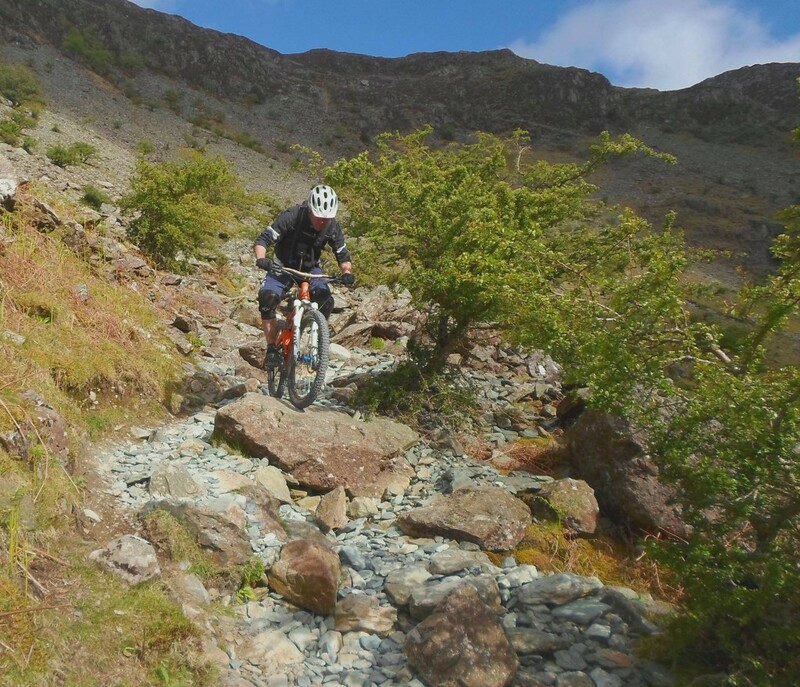 One of the advantages of doing the route this way is that you’re thoroughly warmed up – riding wise – for the most demanding and risky descent of the day – and you’re also within walking/hobbling/crawling distance of your vehicle if you do suffer an injury or explode a wheel on those rocks. The final tally then (according to the almighty Strava) was 1,545m of ascent (and descent obvs), 25km covered and four hours and 11 minutes moving time – plus a couple of hours non-moving time. It was tough for sure, but it wasn’t the most physically demanding ride ever. The defining factor of “the tour” for me though is that it packs in the biggest concentration of technical descending per KM covered of any ride I’ve ever tackled. What’s even more remarkable is that it’s fully legit, with the key tracks all being bridleways. If you like a bit of rocky tech, get on it – but either get an early start or maybe wait until the days are a bit longer.